Foreclosure - Ulrich, Scarlett, Wickman & Dean, P.A. The best defense against institutions is to know your rights. Banks count on homeowners not knowing their rights. However, both state and federal law provide homeowners specific protections against foreclosing lending institutions. Understanding these protections can help too, at the very least, delay losing your home. As experienced Sarasota area foreclosure defense attorneys, Ulrich, Scarlett, Wickman & Dean, P.A. can help explain these protections. Many homeowners believe that once they fall behind with their mortgage payments, foreclosure is inevitable. The truth is that even homeowners who fall behind often have options and may be able to keep their home and modify the terms of their mortgage. 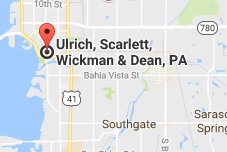 Get the Best Ulrich, Scarlett, Wickman & Dean, P.A. At Ulrich, Scarlett, Wickman & Dean, P.A., we have experience taking on lending institutions and their attorneys. We leverage procedural and legal strategies to mount an aggressive defense designed to, at the very least, keep you in your home for as long as possible. We take the time necessary to make sure you get the representation you deserve. Contact our office today for a free initial consultation. We represent clients in Sarasota, Bradenton, Lakewood Ranch, Siesta Key, Longboat Key, Osprey and throughout Sarasota and Manatee County. If you are facing a foreclosure, each day counts. Do not delay; call 941.955.5100.